Celebrate the sun and greenery in your bird garden all year with these Heritage Farms Sunflower Staked Bird Feeders. 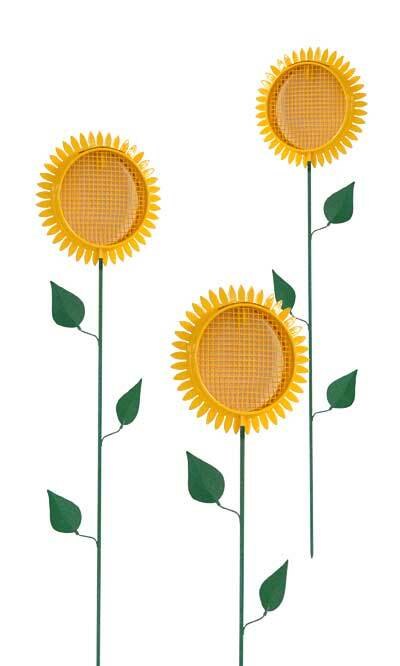 These 3, adorable feeders each perfectly mimic a sunflower, bringing a vivid look to your landscaping in moments. An 8 diameter, bright yellow disc with petal accents forms the top of each feeder, and a generous, steel stake extends from the base of each to further the effect. The mesh center of the blooms each holds 0.5 quarts of sunflower seed or peanut chunks, and clinging birds can easily reach the treat through the 0.25" square mesh. Leaf figures extend from the 29" long shaft for extra dimension and perching spots, and the pointed end on each rod inserts into soil in moments. The powder coated finish on each steel feeder remains bold and durable for many seasons, and a small section on the top of each bloom removes for refilling the reservoirs. Add vivid color and familiar flowers to your landscaping using these Sunflower Staked Bird Feeders. Note: This case pack contains 3 of the Heritage Farms Sunflower Staked Bird Feeders.